At D Cross Barn Co we love Pole Barns. 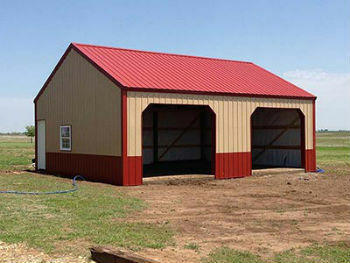 There are so many advantages that people do not know about that Pole Barns allow you to have. Here are four reasons why we would suggest getting a Pole Barn. They are affordable, flexible, have fast construction, and are very strong. Pole Barn construction is very quick and efficient; this allows the labor cost to be lower than other types of construction. If you do not need a continuous concrete foundation it is less money than you usually planned for, which is great! Wood is almost always less expensive than steel, brick, and concrete block. So, using wood instead of other materials will save you money in your pocket. If you choose to use steel siding and roofing, Pole Barns are even more affordable. Buildings can be quickly clad with those steel panels, resulting in more labor savings. Pole Barns go up very quickly. This is because post-frame method is less labor intensive. We can also build Pole Barns year around, so you are not waiting on the weather. Concrete floors can be added later, after the building is up. Pole Barns offer GREAT flexibility. It is much easier and more cost effective to add attractive design features (such as overhangs, steeper roof pitch, porches, etc.) to our buildings than to steel-frame buildings. These barns also offer outstanding flexibility in exterior finishes. It does NOT have to be steel. Pole Barns are very strong and can withstand a lot more than you might think. There are a few things different in these buildings than others that allow it to be sturdier. The columns are in the ground add to the buildings stability and wind resistance. It has horizontally connected posts that form a very strong box that adds to wind and seismic resistance. Knowing these simple facts can determine a lot when it comes time for you to build a Pole Barn. At D Cross Barn Co, we have experienced professionals that will get your barn done quick and done right. Call us today to ask any questions you might have about our Pole Barns!